German exhibition Fakuma, held in Friedrichshafen from 13-17 October, is expected to break another record, having been sold out since February 2015, according to show organiser P.E. Schall. Held in the quaint town that sits on Lake Constance, where Germany, Austria and Switzerland meet, the show is expected to tread in the footsteps of the 2014 show that had nearly 1,800 exhibitors and 46,000 visitors from 117 countries. Highlights include additive manufacturing, or 3D printing, along with injection moulding, thermoforming and extrusion. Kraiburg TPE will present new TPEs the result of partnerships with component manufacturers. The German company will showcase a drinking water-compliant DW/H series as a PVC replacement material for hoses in showers, dishwashers or related applications. It has also developed TPE compounds for consumer applications that feature improved adhesion to engineering thermoplastics such as PC and ABS. TPE compounds with FDA and EC 10/2011 food certifications for valves will also be featured. Features are efficient processing in two-component processes, resilience and reliable adhesion to hard components. Meanwhile, the company’s Thermolast V compounds, increasingly specified for seals in under-the-hood, will go into production. A new series of styrenic block copolymer (SBC) elastomers from Teknor Apex Company exhibits performance comparable to that of thermoplastic vulcanisates (TPVs) widely used in window gaskets and as new options for building product manufacturers. Unlike most TPVs used for weatherproof seals in metal, wood, or PVC window frames, Monprene IN-23000 compounds are readily available in small lots and precoloured grades and require no predrying. Some grades can also be processed with the same tooling used for PVC profiles at similar throughput rates and die pressures. Like TPVs, the new TPEs exhibit the end-use properties essential for air and moisture-proof window gaskets, including rubberlike seal recovery, lowtemperature toughness, and UV resistance. Another company highlighting TPEs will be Müller Kunststoffe, the German arm of Hexpol. 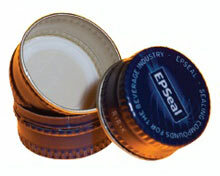 It will be presenting EPSeal TPEs for food and beverage caps and closure applications. EPSeal includes grades that can be used for crown corks, aluminium rollon closures, PP and HDPE plastic closures of various diameters; as well as grades for wine corks and T-stoppers for spirits with high alcohol content. Having launched in March 2015, PolyOne will provide updates on its reSound NF natural fibre-reinforced solutions. Containing at least 30% engineered natural fibre by weight, these offer an alternative to glass fibrereinforced PP compounds, with comparable mechanical properties at 5-10% lower density. Currently available in black, brown or natural, the US firm will introduce brilliant colours. Another update will be on 3D-MID (three dimensional moulded interconnect device) manufacturing technology highlighted at Fakuma 2014. It uses thermally conductive properties of PolyOne’s Therma-Tech engineered polymers and is purportedly a time and cost-saving means to produce the 3D-MIDs that serve as heat sinks in LED lighting, as an alternative to the complex printed circuit boards now fairly ubiquitous in these applications. DuPont will go down memory lane with its signature Zytel nylon material, launched in 1935. Since then it has been used in the automotive, electrical & electronics, medical and healthcare sectors and large connector applications. It will also show the use of CAE software for the product development cycle, especially in the automotive sector and for the healthcare sector, its Special Control (SC) and Premium Control (PC) grades. UK-based Victrex’s acquisition of US gear specialist Kleiss Gears will allow it to push through to the automotive sector its PEEK materials. It will also show a hybrid-moulding process that combines the strength of continuous fibrereinforced PAEK composites with the design flexibility of PEEK injection-moulding solutions. Also, the fusible-core technology of Dutch moulder Egmond Plastic can achieve cost savings of 30% and weight savings of up to 50% in the manufacture of complex pump housings. As well, British precision moulder Denroy Plastics has joined forces with Victrex and Bombardier to develop small to medium-size brackets, previously cut from aluminium and titanium, from PEEK for aircraft, reducing weight and costs. 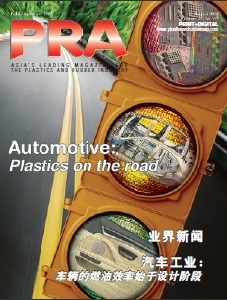 Spain-based Elix Polymers will focus on new generation ABS materials for the automotive industry. The high heat ABS grades combine low emissions and high flowability; well-balanced mechanical properties, high heat resistance and processability and paintability. The company recently extended its presence in North America, focusing on its global portfolio of ABS and PC/ABS products. US compounder RTP Company will feature a new proprietary alloy technology known as RTP 2000 HC, a series of specially formulated compounds designed to maintain strength, functionality, and integrity, even with repeated exposure to hospital cleaners used to disinfect medical devices. RTP says it tested a number of materials and a wide sampling of cleaners commonly used in the healthcare industry. The resulting compounds were developed to open new possibilities for the design of hospital equipment and plastic housings that require frequent disinfection, including mobile sonar and x-ray machines, enteral feeding devices, drug pumps, blood filtration equipment, and more. Germany-based Arburg will highlight the individualisation of high-volume parts through the combination of injection moulding and additive manufacturing including networking with Industry 4.0 technologies. Also on show at the trade fair will be the innovative lightweight construction process, multi-component injection moulding, LSR processing and practical examples for the medical and packaging technology sectors as well as a micro production cell. Eight further Allrounders will be featured on partner stands. Arburg is providing a microsite for the first time that brings together the latest information about the exhibits, Industry 4.0, lightweight construction, plastic freeforming and partners. German firm Sumitomo Demag, which last year had the fastest machine at the Fakuma, will repeat it again this year with a high-speed El-Exis SP 200 that will be moulding four 125 ml PP gourmet containers with removal by a robot, in just under 2 seconds. 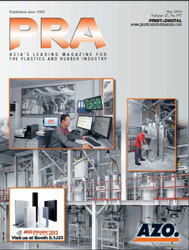 The mould and automation equipment will be supplied by Dutch firm Brink BV and the PP by Borouge. Features include activeQ/Q+ mould protection for sensitive monitoring of the clamping unit and activeCool&Clean cooling and filtering system. In addition, making its debut will be a production unit for complex decorated lightweight parts with a Systec Servo 210, and an all-electric IntElect 100, equipped with activeFlowBalance for balancing the filling of its four cavities. KraussMaffei will feature its hydraulic CX160 machine showcasing laser and hologram surface effects made possible by a dynamically inductive mould temperature control system (Dynamic Mould Heating or DMH) from RocTool and tooling from Roctooling. The moulds have special surfaces with different effects (matte, high-gloss, with punched holes). Meanwhile, a CX300 will show KraussMaffei’s FiberForm process, combining injection moulding with thermoforming of composite sheets to further improve the strength. It will produce airbag housings in cycle times of 42 seconds, with weight savings of 40%. Partners include Takata and Christian Karl Siebenwurst. In LSR, it is demonstrating nasal ventilators made on a cleanroom 50-tonne AX SilcoSet all-electric machine in a four-cavity mould. The SPX10 sprue picker takes the parts, separates them and deposits them. The Elmet metering and mixing unit provides for optimum draining of residual fluids, ensuring that no material goes to waste. KraussMaffei sister company Netstal will introduce the world’s first injection compression moulding system, developed in cooperation with French companies Plastisud (stack mould) and Machines Pagès (automation). It will manufacture a 10.7 g PP margarine tub on an Elion hybrid 2800-2000 with 4+4 cavities. With IML decoration, the cycle time is 5 seconds. The cavities are partially filled in 100 ms and the process is performed at a low pressure to prevent tension in the material. Benefits of the process include narrow wall thickness and a lighter weight. Furthermore, the end product (lids in particular) shows fewer signs of distortion and has a greater dimensional accuracy due to the lower stresses placed on the material. There is also a significant increase in productivity through the use of a stack mould and reduction in material costs by up to 20%. Austrian firm Engel will demonstrate the Clearmelt technology for the manufacture of decor elements with wood veneers for automotive applications. The veneers are back-injected with PC/ABS, in a two-cavity mould on a Duo 3550/650 combi M, in a single step and coated with transparent polyurethane to protect the surface. PU technology is provided by Hennecke. First introduced in 2009, the first serial application is at HIB Trim Part Solutions. For LSR, in collaboration with Schneegans Freudenberg Silicon and Elmet, it will show diaphragms made of glass fibre-reinforced PA and LSR on a Victory 200H/60L/140 combi with an integrated Viper robot. In each cycle, the robot removes eight PA parts and transfers them to the second set of cavities in the 8+8-cavity serial mould, to be overmoulded with LSR. While LSR processing is going on, a new set of base bodies is created. A first for the company at Fakuma, Engel will present an integrated, fully automated process for manufacturing thermal switch housings, from the raw material to the 100% tested and labelled metal/plastic composite parts. It will be shown on a 60V/35 single vertical machine, together with partner MMS Modular Molding Systems. A strip uncoiler, press module and processing module for thread tapping are positioned upstream; downstream, there are quality controls, a laser marking system and another press module. In the packaging sector, Engel will run an Emotion 440/160 producing 155-ml round containers with an integrated tamper-proof seal on a four-cavity mould from Otto Hofstetter. IML automation is implemented by Beck Automation. For medical, an Emotion 170/80 TL will be producing needle holders for 1-ml safety syringes in a 16-cavity mould from Fostag Formenbau. The filigree PS parts, with a shot weight of 0.08 g, are designed with a predetermined breaking point that makes it impossible to re-use the disposable syringes. Dr Boy will partner with ProSeS BDE for its data entry systems. The software of the BDE system accesses the internal Boy Procan Alpha machine control. Machine settings, collected operating parameters as well as production data recorded by the machine control, such as injection volume, temperatures, pressures, can be recorded and reused. From every IT workstation with online access, the required data can be interrogated using the IP address of the Boy machines and can be used for the downstream BDE functions. Another “smart solution” will be the new online energy calculator, able to work without additional programmes, without any connection to portals of the machine manufacturer and without expensive service contracts. As for processes, the German company will demonstrate on a 60E, toothbrush bodies that will be removed by a Kuka six-axis robot. On a 100E, the integrated linear handling device SL30 will remove the moulded 2C parts and place them on a conveyor belt. In addition, the transfer system on the 35E VH insert moulding machine equipped with 2C technology and hot/ cold mould concept will communicate with the Procan control. Boy says it has another “online surprise” that will be presented for the first time, which it will reveal at the show. US machine giant Milacron, combined with its brands Ferromatik, Mold-Masters, Uniloy, DME, Tirad and CIMCOOL, will introduce the new Magna T in the European market. The Toggle 200 machine, equipped with a mould from Haidlmair, will produce a PP storage container. It will also launch the Elektron Evolution, boasting 60% less energy and 90% less water than hydraulic machines, reducing operating costs. 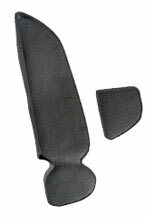 An EO 75 model will be producing a two-component part made of PA6 (with 30% glass fibre) and TPE using a Braunform mould. The TPE will be injected using Mold-Masters E-Multi auxiliary injection unit. Meanwhile it has upgraded its Ferromatik-Series F120 to a fully automated production cell with an integrated Zahoransky robot system and a combined onecomponent and two-component mould, producing on one-side 1C razors and on the other side 2C razors. Following the launch of Klear Can at the Florida NPE show, Milacron will have a co-injection display. Klear Can is a multilayer plastic that will replace metal food cans for the packaging of long shelf-life items such as fruits, vegetables, fish and meats. The packaging is BPA free and can run in existing filling, seaming and retorting lines at canneries.